I'm taking a break from my inter-state moving hiatus to participate in this month's Secret Recipe Club. The Secret Recipe Club is a group of food bloggers who secretly make one of someone else's dishes and post them all on the same day at the same time. It's really fun, choosing a recipe to make, making the recipe, then reading about everyone else's recipes. It's a great way to "meet" other bloggers and check out some great blogs that you never knew about before. This month I was assigned a great blog called Delishhh. Delishhh is written by Ewa, which I understand is pronounced like "Eva". That's pretty cool because Eva is my youngest daughter's name. :) Ewa was born in Sweden, raised in Asia, and now lives in America. So she has a really interesting culinary perspective! Her blog is very aptly named as everything on there is amazing. Her recipes represent every place that she has lived across the world. I had a hard time deciding which recipe to make. If the timing had been slightly different, it would have been a slam dunk. I really wanted to make her Västerbotten Cheese Pie. I love me some cheese, and this pie is so beautiful. Unfortunately, I couldn't find Västerbotten cheese. 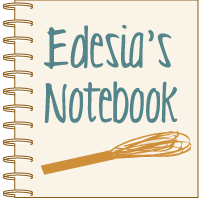 If I had been assigned Ewa's blog just one month later, it would have been a breeze. I mentioned that I am in the middle of a move? We are moving to Kenosha, Wisconsin, home to the infamous Mars Cheese Castle. Yes, a whole castle full of cheese right in my own town! It's a foodie's dream! I am certain that had I been there already I could have found that cheese there. But as it turned out, I got this assignment about a week after visiting there for the last time before the big move. You better believe I will be trying that pie as soon as we get settled there and I have my kitchen set up again. Several other recipes caught my attention too. I really liked the looks of her White Bean Puree (I love white bean dips), Swedish Split Pea Soup (perfect for that -4 degree weather we had last month! ), and her No-Bake Nutella Cheesecake. Yum! The recipe I finally chose was her Thai Chicken with Plum Ginger Sauce. I just loved the sound of that flavor combination. Ewa makes that dish using chicken, but she says in her post that she is sure it would be great with other types of protein and that if anyone tries a different one, to let her know how it turned out. I decided to take her up on that and made it with salmon. I just love fruity flavors on salmon (in the past I have done orange, lemon, apricot, blackberry, and even rhubarb). So I jumped at the chance to add another one to my repertoire. Place the salmon filets in a Ziploc bag. In a bowl combine plum sauce, whiskey, sugar, fish sauce, ginger, garlic and chili sauce. Pour the marinade into the bag with the salmon and close. Refrigerate for 2 hours. Preheat oven to 400°. Remove salmon from bag and place in an 8x8” or 11x7” baking dish. Pour marinade over the salmon. Bake, uncovered, for 20 minutes or until salmon flakes easily with a fork. Serve over gingered brown rice. I love cooking Asian food but had never tried plum sauce before. It is so good! It's sweet and tangy and very complex. The plum sauce combined with the other ingredients (I left out the whiskey because I didn't have any) makes for one flavorful marinade. A little sweet, a little tangy, a little salty, and just the right hint of heat. And I love how the ginger really stands out too. Love that stuff. So, Ewa, now you know that this is really good on salmon too! Thank you so much for an awesome recipe. Everyone at my house loves salmon so it's always great to have another go-to recipe for it. And I'm definitely going to try this sauce on chicken sometime too! You probably won't see much from me this month, but I hope to be back to doing regular posts in March. Have a great February! You did it again, another totally delicious SRC recipe. Good luck with the rest of your move. yum! I love salmon, and this looks great! I love your choices on this recipe. Beautiful, delicious and healthy ... there is nothing better! I can't wait to try it! !